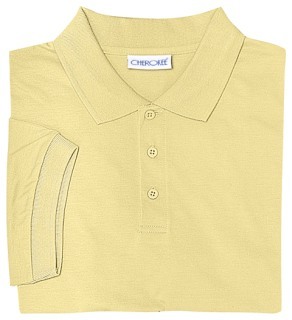 Adult unisex short sleeve unisex polo in a combed cotton, ringspun interlock knit with a 3 button placket and matching ribbed collar and cuffs, reinforced shoulder seams and double-needle hem. Colorfast, easy care 60% Cotton/40% Polyester. Also available in 58830 (Toddler 2T-4T), 58912 (Youth XS-XL).